Introducing Religion 0 Edition What is religion? How is it to be explained? Why do human beings believe in divinities? Why do the beliefs and behaviors we typically describe as religious so deeply affect the human personality and so subtly weave their way through human society?Introducing Religion: Readings from the Classic Theorists presents eleven key texts from influential theorists who played a pivotal role in the modern enterprise of explaining the phenomenon of religion. These writings seek to account for the origin, function, and enduring human appeal of religion by drawing on methods of scientific scholarship unconstrained by theological creeds or confessional commitments. An ideal companion to author Daniel L. Pals' textbook, Eight Theories of Religion, Second Edition, or other beginning texts, Introducing Religion opens with selections from the works of Edward Burnett Tylor and James Frazer--Victorian pioneers in anthropology and the comparative study of religion. It then offers entry into the provocative analyses of Sigmund Freud, Emile Durkheim, and Karl Marx, whose aggressive reductionist approaches framed the explanatory debate for much of the century to follow. Responses to reductionist theories--and new directions in explanation--claim a place in selections from the works of philosopher-psychologist William James, theologian Rudolf Otto, sociologist Max Weber, and comparativist Mircea Eliade. The volume ends with discussions drawn from the celebrated field studies of British anthropologist E. E. Evans-Pritchard and the interpretive anthropology of American theorist Clifford Geertz, whose fieldwork took him to both Asia and the Middle East. Brief career portraits of the theorists at the outset of each chapter give context to the readings, and a general introduction features guiding questions designed to help students assess and compare the different theories. 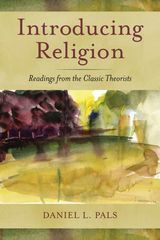 Offering an illuminating overview of this controversial and engaging subject, Introducing Religion: Readings from the Classic Theorists is ideal for introductory courses in religion as well as courses in method and theory of religion, world religions, and sociology, psychology, or anthropology of religion.